If you were trying to escape from the Germans in the Second World War, surely the last thing you'd want is an elephant tagging along to slow things down. 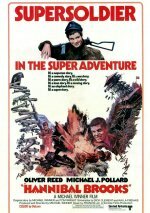 And yet that's just what happens here, as PoW Oliver Reed tries to cross the Alps via pachyderm in Michael Winner's stab at war comedy. Michael J Pollard, Oscar-nominated for his role in Bonnie and Clyde, and John Alderton join the antics. The scenery is stunning, filmed in several locations across Austria. Hannibal Brooks has been supplied to us by a member of the original film crew in high quality digital dvd format. The quality is much higher than the Korean import on Amazon.co.uk.